And on Sunday at Monza the Williams-BMW did not have any of it - even if the car was quite impressive. It should have been. Monza is a track where the Great King Horsepower is the undisputed ruler. For 70% of the lap the engines are screaming at full voice. The BMW V10s scream louder than the rest... and on Friday the 13th the Bavarians announced that their engines were running at more than 19,000rpm. They even gave us a graph to prove it. No-one disputed the claim. It was all very impressive: 158 ignitions per second in each cylinder, about three times faster than production car engines. "Awesome statistics," said the BMW press release, written by someone who has spent some time in America. This was a neat bit of PR for BMW but there were other agenda too. All year long the BMW people have been leaning on Williams to improve the chassis. And they have. Monza is not just about power. It is also about reducing drag and about setting up a car so it can ride over curbs smoothly. And the Williams did both of these. And that is how it was that the team ended qualifying having beaten one of its old records. Juan-Pablo Montoya beat Keke Rosberg's famous qualifying average speed record of 160.938mph. It had stood for 17 years. It was clear that this time the Michelin tires were good and the Ferrari men were worried. They were so worried in fact that on Sunday morning they decided to cover all options and put one driver on one strategy and the other on another - just in case. Traditionally it is the job of Rubens Barrichello to be thrown onto the Ferrari bonfire and so he got the two-stop strategy. Michael Schumacher got the more conventional one-stop. But as things turned out Williams and BMW took care of themselves. Before the cars had even wandered off on their final parade lap Ralf Schumacher was in the spare, his own racing machine having had an engine problem (Oops, as they say in Munich). Then as the lights went out Montoya made the kind of start usually reserved for very fast snails. Monty did what one does these days and swerved across the road to make sure that Michael Schumacher was unable to take advantage of this and Ralf found himself looking down towards the Curva Grande with nothing blocking his view. And, being a racing driver, he assumed that it would be a good idea to drive that way. As this was happening his brother was neatly boxed in and had Barrichello beside him. Down they came into the first chicane like animals heading for Noah's Ark: two by two. The Williams boys braked - or at least Montoya did. Ralf tried to make the corner, squeezed Monty, who being a cool, calm individual tried to get out of the way and remain on the race track. Ralf then realized that he was wasting his time trying to go round the corner and so drove over the chicane. He was in the lead. Of course he had broken the rules and that meant that he would be getting into trouble from the FIA and he had screwed up Montoya (so he would be getting into trouble from the team). Fortunately Montoya managed to keep going and even managed to keep the two Ferraris behind him. If Michael had not been busy saying: "After you Rubens" it might have been a different story but everyone got in everyone's way and that meant that a little further back David Coulthard did what is known as "doing a Haberfeld" (a phrase coined on the Saturday when the Formula 3000 driver Mario Haberfeld drove into the first corner and punted off his own team mate) and ran into the back of Kimi Raikkonen. If Eddie Irvine had been behind DC he would have laughed into his helmet as the pair have been lobbing abuse at one another for some weeks now. 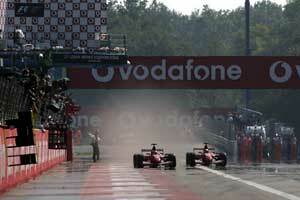 All this meant that Ralf took off into the lead and Montoya found himself with a Ferrari up his chuff. According to his nearest and dearest in the Williams garage Juan Pablo was what is known as "fuming" at what Ralf had done. The team sent a message to Race Director Charlie Whiting if he thought Ralf would be punished and he replied that Schumi II should do the right thing and allow Montoya into the lead at the earliest opportunity, lest he fall victim to official justice. The team had just received the reply as Ralf came steaming into view at the end of lap 4. The problem was that he really was steaming - or perhaps smoking is a better word. In fact he was blowing up in no uncertain terms. And as he was doing so all that oily smoke was going straight into the path of Montoya. Racing drivers regularly drive into clouds of smoke without knowing what they will find on the other side but Montoya hesitated for a split second. In doing so he gave Barrichello the chance to jink for the inside, pick up the hint of a tow and then carry that little bit of extra momentum all the way down the road to the chicane where he duly outbraked Monty and took the lead. In a flash Rubens had gone from third to first and Williams's day had turned chilly. It would get chillier. A couple of laps later Montoya slipped a little wide under pressure from Schumi I and went for a little bounce across the third chicane. It was nothing too major but give a Schumacher an inch and he will park a car in it and so by the time they reached the Parabolica Michael was up to second. As things turned out the two strategies were not that different although it is hard to say for sure because by the end of the race the Ferrari men were only playing about in order to get to the finish line together. When Rubens stopped for the second stop on lap 37 he emerged just ahead of Michael. Michael admitted later that he was warned that it was going to be very close and "we dealt with it appropriately". Let us just say that Michael did not force the issue. Rubens stayed ahead. Michael was right behind him. In the laps that followed Rubinho pulled out a gap of 18 seconds and then lost it all again, but the lap times were so bizarre that it was obvious that the two men were just playing. If they had been hard at it they would have broken Peter Gethin's fastest ever average speed in a Grand Prix, which has stood at 150.753mph since Monza 1971. But they were not and so crossed the line having managed 149.941mph. This would have lobbed third place into the lap of Raikkonen (who had survived Coulthard's assault at the first corner) but on lap 30 his Mercedes-Benz V10 went "ker-boom" again and the Flying Finn came in to land, with a trail of smoke worthy of a victim of The Red Baron. One had to look quite a long way back to find the next runner. This was Eddie Irvine in the Jaguar who was doing a passing impersonation of Lazarus with both his team and his career. The Jaguar is not a classic motor car but the Jaguar engineers have worked hard - changing everything about from the chassis (and the driver) in order to make it respectable. And to give him credit Irvine embraced the luck of the Irish and, as Ron Dennis would say, maximized the potential of his window of opportunity and optimized the result. Pedro de la Rosa had done quite well in qualifying but he lost out in the first corner melee and found himself mixing it with Felipe Massa in the midfield (which is a dangerous occupation given Felipe's love of the spectacular). De la Rosa was obviously quicker but could not get ahead until lap 15 after he drove across the chicane (and gained an unfair advantage). Massa might have waited for the FIA to act and tell de la Rosa to give back his place but one got the impression that a red mist descended and on lap 16 the two cars collided at the Ascari chicane. Both would retire as a result of that incident and later the FIA Stewards would inform Sauber that Felipe had become the first man to be given the much-vaunted 10 grid position penalty at the next race. Massa will start the United States Grand Prix at Indianapolis from the airport. Massa was having a record-breaking kind of day because he was also the first F1 driver ever to race with the HANS safety device... Still if one cannot get into the record books by winning races there are always others ways of doing it. Sauber's hopes of glory (which were not great) were then destroyed completely by a two-stop strategy which dropped Heidfeld from eighth during the first stint to 10th by the end of the race. Toyota should have picked up some serious points on this occasion because at the end of the first lap Allan McNish and Mika Salo were running seventh and eighth but McNish ended up going out early on with a front suspension problem when he was running sixth and Salo blew his chances at his pit stop when he drove across the white line at the pit exit and was given a drive-through penalty and that dropped him back to 11th by the finish. And so the right to be fourth and fifth was delivered (hand-wrapped) to Renault. The cars had chugged around all weekend looking slow but, for a change, they were reliable. The engines produce so much power that the rear wings were small enough to make rivals giggle and that meant that when Jarno Trulli and Jenson Button tried to go around corners the cars seemed unwilling to follow the command. The race began with Jarno's car failing to fire up and so he was sent to the back of the class. He produced a very good first lap to overtake seven cars but then settled in to going round and round. He was overtaken by Button at the pit stops but the team soon remedied this situation by radioing Jenson and telling him to let Trulli pass. And that was about it really. The pair went round and round until someone stuck out the checkered flag and the team took home five points which will probably be enough to guarantee fourth place in the Constructors' Championship. The last World Championship point went to Olivier Panis in his BAR-Honda and that was a great effort because Olivier was 16th on the grid. The team chose a two-stop strategy and it worked perfectly as Olivier was up to ninth at the end of the first lap and sixth when he pitted on lap 19. He dropped back to 11th but went back to third before his second stop and that meant he ended up sixth. Villeneuve, who ran a one stop race ended up 9th - which was where he was at the end of the first lap. For most of the middle part of the race the Honda cars jousted with one another (although Takuma Sato was down the back after an early spin). In the end Fisichella fell victim to the recovering Coulthard and so the Jordan finished eighth. The two Jordans made it to the finish with Fisichella eighth and Sato 12th (after a spin) but even team boss Eddie Jordan admitted that the cars were just not quick enough. Minardi managed to get Yoong to the finish but he was six laps down after the car suffered an electronic problem during its pit stop. The problem was solved and Yoong rejoined but there was nothing much he could do. Webber might have achieved good things because in the early laps after getting in a bit of a tangle with Yoong on the first lap, he retook the position and was then able to keep with Fisichella's Jordan but then on lap 21 the car simply stopped. At the end of the race the Ferrari fans showed their usual passion for a Ferrari victory - impressing even Michael and Rubens with their enthusiasm. And why not? The fans do not care how the race was won - all that matters is that it was. Thirteen wins from 15 races.